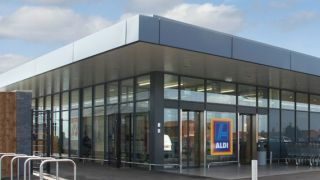 Low-cost supermarket Aldi has announced it will start selling its first smartphone from August 7, in the form of the Medion Life E4001. At just £79.99 SIM-free the handset is certainly affordable, but it looks less appealing when you check out the specs. The 4-inch 480 x 800 display is the bare minimum we expect from phones these days, while the 1GHz dual-core processor, 512MB of RAM, 4GB internal storage, 2MP camera and 1300mAh are nothing to write home about. Rather more disappointingly is the fact the Life E4001 is stuck on Android 4.0 Ice Cream Sandwich - an operating system that's been usurped not once, but twice - and will be another generation older come September/October with the arrival of Android L.
For around the same price you can get the Lumia 520 or Lumia 630 - two Windows Phone with newer operating systems and better feature sets - the Moto E, the excellent Moto G or the 4G-enabled EE Kestrel. In short, you're spoilt for choice at this price point. While Aldi's first foray into the smartphone market may not make many waves, it does show intent from the supermarket chain - imagine if it struck a deal with the likes Oppo, OnePlus or even Motorola - the latter of which is owned by the same outfit as Medion, Lenovo. Suddenly low cost phones from Asia could flood the UK market, making it a lot easier for consumers to get hold of high-spec, yet affordable handsets, giving Samsung, Sony, HTC and LG something to really think about. Of course this is all speculation, but while we recommend you skip this particular handset it's probably worth keeping an eye on Aldi for the future.